At the end of each academic year the Department of Electrical and Computer Engineering hosts the dynamic, interactive "ECE Expo"! This showcase event gives our final-year undergraduate students the opportunity to formally present their final-year capstone design projects, which are a culmination of their years of rigorous undergraduate study. Everyone is welcome to join us for an exciting day of discovery! At the end of each academic year the Department of Electrical and Computer Engineering gives undergraduate students the opportunity to formally present their final year design projects at ECE Expo, just as their graduate counterparts do with their research findings. This event gives students the chance to gain feedback from faculty, peers and staff in their own and other disciplines. Students in the full-year Elec Eng 4OI6 & Elec Eng 4BI6 capstone courses work in groups, designing and developing a project using the cumulative knowledge they've gained throughout their degree. These groups compete for prizes within three categories - Electrical Engineering, Computer Engineering, and Electrical & Biomedical Engineering (the three programs that our department offers). During ECE Expo they are judged by industry professionals according to certain criteria, and the winners are announced at the end of the event. All undergraduate ECE students are encouraged to attend to see what they can expect to have achieved by their final year! Everyone is welcome to attend! Admission is free. 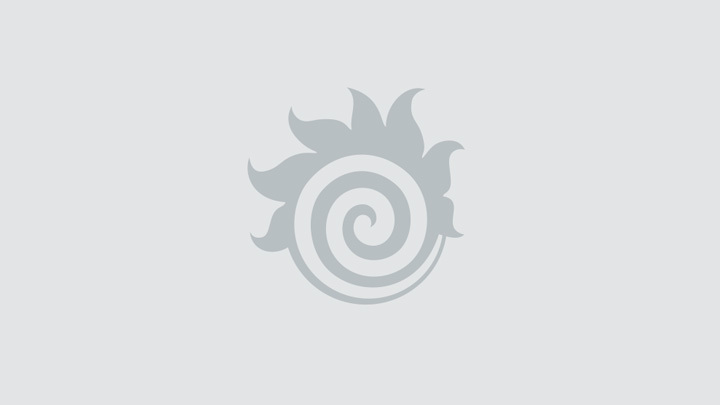 Drop in & browse at your leisure! And don't hesitate to request a demonstration and ask questions! Photographs from past ECE Expos (and Poster Days, as the event was previously called) can be found on our FlickR page, and videos can be found on our YouTube page. ECE Expo 2017/18 - On April 5, 2018, we showcased 48 projects (184 students presenting their group projects). In addition to the top 3 projects in each category, we presented an inaugural award for the "Most Innovative" design project - all of these awards had cash prizes, courtesy of the ECE Department, and our corporate sponsors Texas Instruments, McMaster eHealth Graduate Program, and The Forge at McMaster. Keysight Technologies again awarded a "Best Electronic Hardware" prize, and Gap Wireless again donated gift certificates for a raffle! ECE Expo 2016/17 - On April 6, 2017, we had 182 final year students present 50 design projects to the community! Check out the prize winners and our terrific sponsors in the adjacent headers. Keysight Technologies presented a "Best Electronic Hardware" award, and Gap Wireless provided a raffle of gift certificates! ECE Expo 2015/16 - On April 8, 2016, 157 final year students in our department presented 41 design projects to the community. 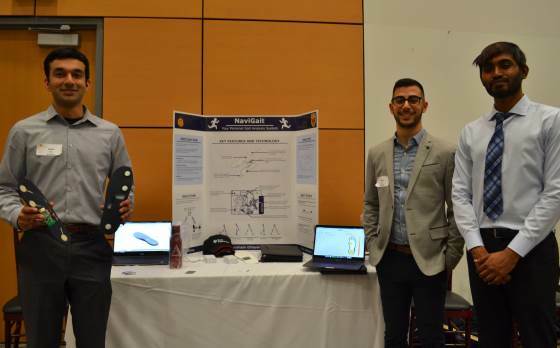 This year McMaster's W.Booth School of Engineering Practice provided a special award to the student group that demonstrated the most innovative or entrepreneurial idea. The award was $500 for the group, plus each group member was offered a free application to any of the W Booth School's master's degree programs in Engineering Design, Engineering Entrepreneurship & Innovation, or Engineering & Public Policy. ECE Expo 2014/15 - On April 7, 2015, over 160 final year students presented 46 design projects to the community. This year the event name was changed from "Poster Day" to "ECE Expo", to reflect the great exhibition that it is! We were honoured to have a very special guest - James Politeski, President, Enterprise Business & COO of Samsung Electronics Canada, who enjoyed seeing the work of our students. Poster Day 2013/14 - On April 8, 2014, there were 39 design projects in the showcase. Poster Day 2012/13 - On April 10, 2013, a total of 121 students presented 41 design projects. Electrical and Computer Engineering programs had 30 project groups, and Elec & Biomedical had 11 project groups. Poster Day 2011/12 - On April 4, 2012, a total of 39 design projects were in the showcase - 29 of which were from the Electrical and Computer Engineering programs, and 8 were from the Elec & Biomed program. Poster Day 2010/11 - On April 5, 2011, 39 projects were showcased - 28 from the capstone course ElecEng 4OI6 (Electrical and Computer Engineering programs) and 11 from the capstone course ElecEng 4BI6 (Elec & Biomedical Engineering program). Poster Day 2009/10 - On April 6, 2010, a total of 29 projects were showcased in this inaugural event. Cash prizes are awarded for Best in Category (the top 3 placing groups in each of the 3 categories - Electrical Engineering, Computer Engineering, and Electrical & Biomedical Engineering). Other prizes are also awarded, as described within each year. Congratulations to the following prize winning projects! In 2017 a new award was offered, thanks to Keysight Technologies. They provided a "Best Electronic Hardware" award, and gave a multimeter to each student in the winning group. 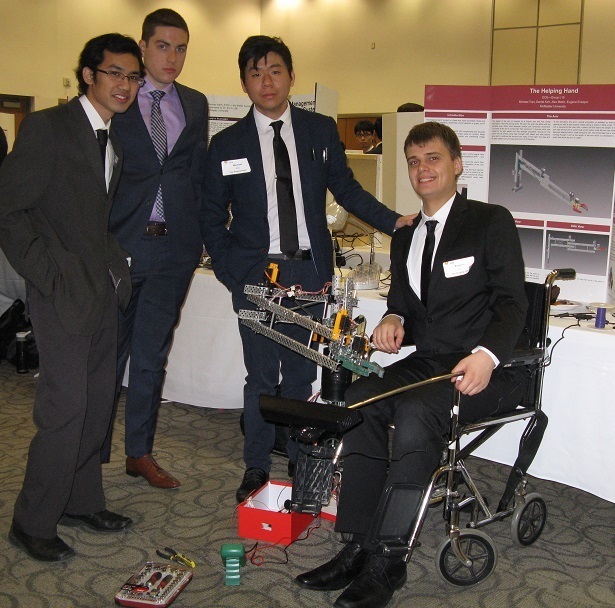 Congratulations to the winning project group "BatCap": Yih-Jwu (E2)Hsiao, Dimitrije Jankovic, Jimmy Nguyen, and Pranav Rawal (from Elec & Biomed). A special award was offered from McMaster's W. Booth School of Engineering Practice recognizing innovation and entrepreneurial merit - a group prize of $500 cash, and each member was offered a free application to any of the WBSEP master's degree programs in Engineering Design, Engineering Entrepreneurship & Innovation, or Engineering & Public Policy. The winners were the “Eye Tracking (EOG)” group - Khalid Asad, Danishbir Gill, Bhautik Gandhi, and Vishal Kharker. ECE Expo photographs can be found on our FlickR page, and project videos can be found on our YouTube page. This showcase of what budding engineers can do draws great interest from industry. Company representatives who come to judge at the event have such a great experience that they often come again! Having judges from industry is a win-win situation - our graduating students get to network with professionals in industry, potentially getting employment leads, and the company representatives can see new ideas and talent! We truly appreciate all of our sponsors! Please check out our wonderful sponsors below. Some of our Capstone Project groups have had success beyond graduating from McMaster's ECE program. The sKan, designed in ECE's Electrical & Biomedical Engineering program 2016/17, has been further developed and is winning very impressive awards! The CPR Glove, a device designed in ECE's Electrical & Biomedical Engineering program 2006/07, has been widely recognized. 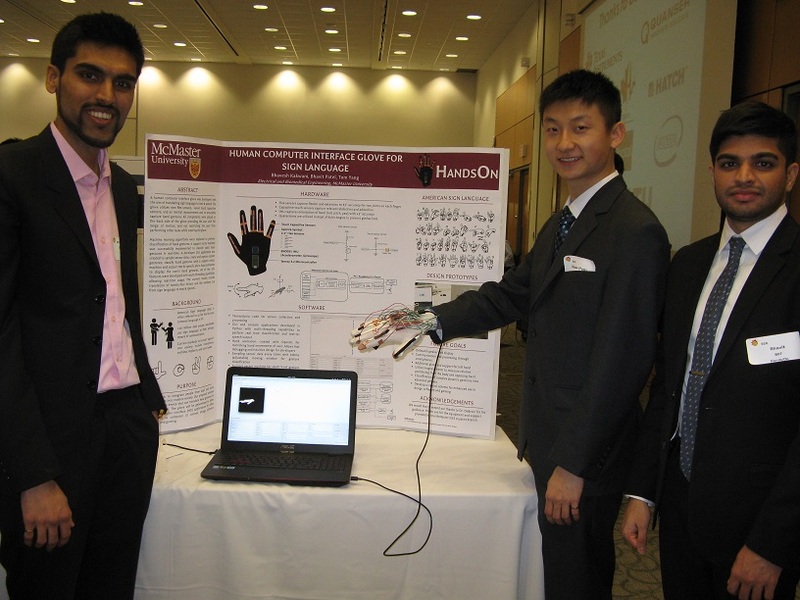 The inventors, Corey Centen and Nilesh Patel won the U.S. Collegiate Inventors Competition's undergraduate category award, and Time Magazine selected the glove as one of the best health inventions of 2007.